High Springs, FL--The Santa Fe River is known for its unusual clarity. Like its major tributary, the Ichetucknee, the river is usually so clear that the bottom is visible even in the deepest sections, and themany springs look like big emeralds or sapphires. 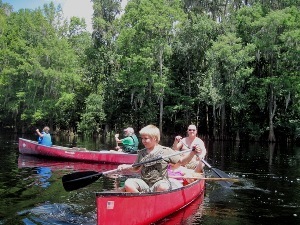 The Fellow Travelers decided to canoe the Santa Fe on July 14, 2012 from the High Springs landing to SR 47. Edwin McCook sent a message that the river was at flood stage but should not present any safety hazards. Edwin was right. The river was as dark as the Suwannee and the springs were so filled with river water that they were not at all clear. Notice that the picture of Brian Moye which was taken at Rum Island Spring. Rum Island is normall a cr ystal-clear pool. Diane and Charlie left Moultrie with Paul Tolar and Diane’s Yorkie, Ami. They pulled a trailer load of canoes. Sam Brown came from Thomasville. Haley Spiers came from Kingsland with her children, Miley and Michaela. Brown Moseley brought his wife, Susan, and son, Reece, from Bainbridge. Roy Moye came up from Altamonte Springs with a slew of descendant Moyes--Eric, Brian, Penny, Gabe, Jacob, Abby, and Sara. This was the first Fellow Traveler trip for Susanh, Reece, Abby, and Penny. The group met at the public landing off US 441 at High Springs. Most of the vehicles were taken to Lamon’s Landing off SR 47, the take-out point. Once the drivers returned everyone prepared for the launch. Miley shared a boat with Sam so Haley could take Michaela in the Penobscot 16. Brown took his pretty Santee kayak but Susan and Reece shared a canoe. Roy soloed and the rest of the Mo yes found suitable rides. Diane and Charlie took Ami in their boat. The Santa Fe’s current was swifter than normal but it was not challenging. Although the water was far from clear the banks were still lush. The first stop was at the US 27 landing. A hgue crowd was at the landing but it was a nice stop. After the stop the paddlers continued downstream. There was no stop at Poe Spring due to the high cost of entry there. Lunch was at Lilly Spring. Naked Ed was there but the lower half of his body was obscured by a wall on his platform. There was a sign soliciting votes for Naked Ed for President since he has nothing to hide. There were several other people at the spring. This was a pleasant stop even though the mosquitoes were having either a convention or a riot. The next stop was at Rum Island Spring. The effects of flooding were obvious and the spring was totally tannic. After leaving Rum Island the trip continued downstream. A few stopped at Ginnie Springs and were even permitted to use the facilities. Just beyond Ginnie Springs the group encountered a little rain but no one donned the rain gear. Around 3:20 PM the group reached Lamon’s Landing. All said good-bye and headed home. It was a nice summer paddle.